Bitcoin Price in a $300 range modeShapeShift bombarded with US DoJ subpoenas in Q4 2018Transaction volumes dip, moving averages slide from 18k to 14k in four daysParticipation levels are low, and with drying transactional volumes, BTC prices are ranging. However, with a flurry of subpoenas, exchanges are wary. All in all, we retain a bullish outlook expecting breakouts above $3,800 as Bitcoin rally to $5,000.Bitcoin Price AnalysisFundamentalsThe US is the world’s largest economy, and as one of the major players in crypto, their regulatory stand can influence asset performance. We can draw examples from their sanctions on Russia and Iran. Their economies suffered as a result of that ban. As a global phenomenon, crypto is designed to be censorship resistant, distributed and without a point of failure.Unlike China, USA might be accommodative but complying with their rules is involving and expensive. It is for this reason that most exchanges prefer to set up operations in Europe and satellites countries like Mauritius or Gibraltar as their laws are lax on crypto.Following the steps of Kraken, ShapeShift has released their recent compliance report. There, we can see that subpoenas more than doubled in Q4with the US DoJ being the most demanding. In total, they made 18 requisitions throughout 2018.🎪✨ Pulling Back The Curtain: How ShapeShift Handles Law Enforcement Compliance: https://t.co/NefZV7xIY8📝 Thanks to @krakenfx for inspiring us to bring more transparency to the #cryptocurrency space. We encourage others to join in on this initiative. pic.twitter.com/RWIailvbF3— ShapeShift.io (@ShapeShift_io) January 18, 2019Candlestick ArrangementsFrom the charts, BTC prices are scant and confined within a tight trade range. Even so, we retain a bullish outlook on Bitcoin as long as our trade conditions are valid. Note that—and as per our previous emphasis—buyers have a chance once prices edge past Jan 14 highs of $3,800.The $3,800 not only doubles up as a minor resistance level but as an essential Fibonacci retracement level based on Dec 2018 high low, a breakout above it preferably with above average trade volumes could lay the foundation for higher highs towards $4,500 triggering conservative long positions.At the moment, none of our trade conditions are valid. 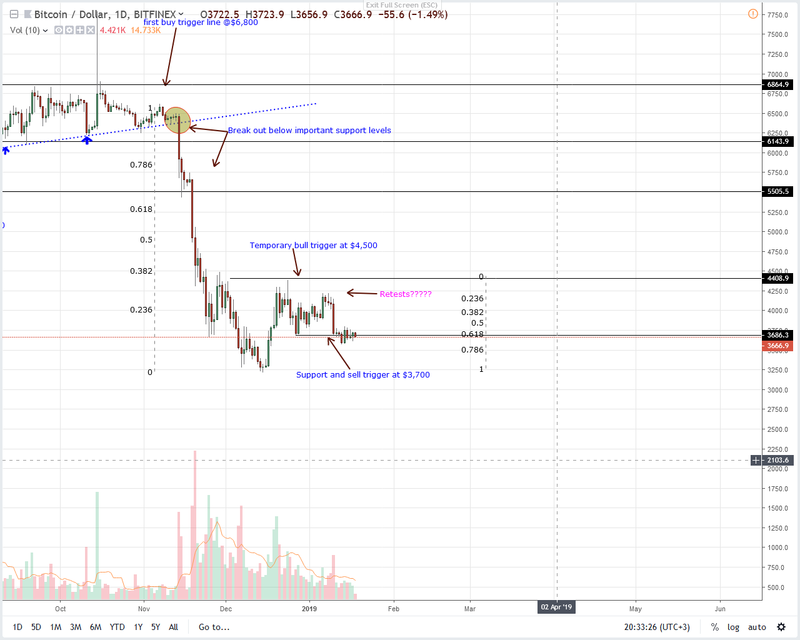 Therefore, we shall retain a neutral outlook aware that losses below $3,700 main support could see prices tumble to $3,200 or lower.Technical IndicatorsStrong price movements can only be at the back of stellar participation. It’s clear that this is lacking and with averages of 14k—down from 18k when prices sank below $4,000 on June 10, any breakout above $3,800 or below $3,700 or Dec 28 should be at the back of above average volumes exceeding 35k or 20k on the lower limit.